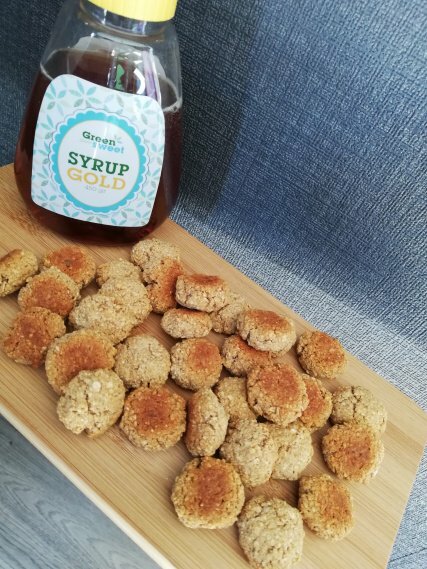 Tiffany from TiffsKitchen has come up with this delicious recipe in which she has processed Greensweet Syrup Gold. Put all ingredients in a container and form a ball. The mixture may be a bit sticky, but if it is too sticky you add some oatmeal. Then wrap the ball in cling film and leave it in the fridge for an hour. Now preheat the oven to 175 degrees and cover a baking sheet with parchment paper. If the dough has been in the fridge for an hour you can make molds. I kept it simple and just made pepernoten. Then they go for 20 to 25 minutes in the oven and ready are healthier pepernoten / gingerbread cookies. My bin was already on after 2 days, so for me it is also high time to make a new batch.